"I want (or need) someone to hike with me!" Have you ever struggled with the challenge of finding a compatible hiking partner, one who has the time and willingness to hike the way you want to hike? Or needed to find a trail buddy when your regular trail companion bailed on an upcoming hiking trip? If you need some assistance in finding an ideal hiking buddy, look no further. The hiking partner finder has arrived. What is Hike With Me? Hike With Me is a fast, easy process for locating a suitable hiking partner. It was created to answer the needs of hikers everywhere, based on the multitude of emails received by Hiking For Her over the past 9 years. Although this website is for female hikers, it's no surprise that the guys are looking for compatible trail partners, too. Who wants to stay home, when you can be exploring gorgeous terrain like this with a trail buddy? Who is Hike With Me for? would like to make a new friend for future hiking adventures. At least that's what Hiking For Her's email is saying about folks looking for someone to hike with. Thus, Hike With Me was invented! You fill out a brief form detailing who your ideal hiking partner is. Here's a sample form, filled out to illustrate what to do. You agree to share your email address. Your choices may differ from this sample. You will be given as many options as possible to choose from. You will be able to add your own comments. Anything else? I would love to learn how to take wildflower photos. A hiking partner who mentions photography skills on their signup form would be great! NOTE: These are just examples of possible answers. Your responses will be different, based on what you're looking for in a hiking partner. Hit the SEND button, and you're all set. Only your email address and first name (not your full name or location) will be shared with a "match", leaving you anonymous until you choose to respond. Hiking For Her will keep your information safe and secure for three months, after which it will be destroyed. It is an honor to receive and safeguard your information. It will not be sold, exchanged or used for any purpose other than finding you someone to hike with. Three months from the date it is received, your information will be deleted from the pool of potential hiking partners. If you'd like to re-enter the pool of hikers, simply sign up again. To search for 2 different hiking partners simultaneously, submit two different forms. Example: You'd like to do day hikes near home as training, while planning a long trail hike in a different country for the upcoming summer. For a flat $10 fee to handle administrative and storage costs, you will gain access to the sign up form. You can use your PayPal account or the credit card of your choice for payment. Once your payment is received and confirmed, you will receive the sign up form. It will take 5 minutes or less to fill it out. Hit the SEND button, and you will be added to the pool of potential hiking partners. The entire process should take no more than 10 minutes of your time. You will see my name, Diane Spicer, as well as the familiar Hiking For Her logo, on the payment page. That's your guarantee that Hiking For Her is going to work hard to find you a suitable hiking partner. while Hike With Me sifts and sorts to match up folks with similar trail goals and interests. Over a three month period, this sift/sort/match process continues to work for you. You'll receive an email with any potential hiking partner's email address, and they will receive one with your email address. Then it's up to the two of you to connect! To remain in full control of your inbox, set up a free email account just for this purpose. You can easily delete that address without touching your main email address. 1. There are no refunds if you change your mind or want to opt out. 2. Once you submit your form, you won't be able to change it. This helps keep the cost low. And the process as efficient and fast as possible. 3. If you decide that you want your name withdrawn sooner than 3 months, send an email using this CONTACT link. 4. Hiking For Her is not responsible for anything that happens once you contact your potential hiking partner. Our goal is to connect two hikers with similar interests. Use your best judgment to set up an initial meeting in a crowded public space with your potential trail partner before you hike with her/him. If all your interactions are online, ask for facts you can verify. Don't exchange personal information until you're ready. The size of the "hiker pool" at the time you enter it will determine how many potential hiking partners you find. There is no way to control this number, and so there are no guarantees or refunds. How many partners can I find? There is no limit to the number of possible matches that Hike With Me can find for you in 3 months. If HWM finds 3 matches, you receive all 3 contact addresses. There is no upper limit for the number of matches you can receive. And don't worry about being flooded with unsuitable matches. You specify the attributes of your ideal hiking partner, and that's what Hike With Me uses to search out the best partner for you. Caveat: If a match that's close to what you asked for turns up, you may be contacted via email to green light or say no thanks to this potential hiking partner. 1. Stay as general as possible. 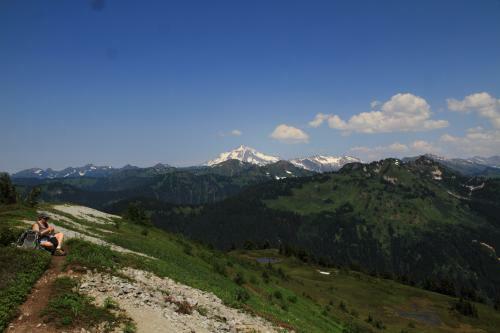 “I want a partner to hike counterclockwise on the Wonderland Trail, Washington State, USA from July 10 – 25, 2016” will not get as many results as “Looking for a partner for a two week Wonderland Trail trip within the next three months”. You can work out the time window, start and end points later, right? Finding a partner for a general location (country, state, province, region) is the first step. Putting your heads together to plan a perfect hiking trip in terms of time, location and skill level will come next. Be pleasantly surprised by what your hiking partner might suggest! 3. Read the Happy Trails free monthly newsletter for possible hiking partner postings before you sign up. If you're a female hiker over the age of forty, you can join our Over Forty Hiker community for a month (or annually) to see if anyone is located near you, or has long trail hiking plans that match yours. If you have questions that weren't answered here, please contact me. If you're ready to get started down the trail to finding your ideal hiking partner, click the button below. This service also works for experienced hikers who would like to mentor beginning (novice) hikers. Pass on your trail wisdom and hiking skills. And for folks looking to thru hike in the upcoming season. The success of Hike With Me depends on the level of involvement from hikers just like you. If you're serious about getting out more often on hikes, or want to enjoy longer hiking trips, use this fast and easy process to find your ideal hiking partner! Hiking For Her reserves the right to change the policy and parameters for Hike With Me as needed to ensure a quality experience for everyone. And as noted, there is no guarantee your ideal hiking partner will be located through this process. We can only try!